Discovered in 1731, M1, the "Crab" nebula is the remnant of the supernova of July 4, 1054AD. (A supernova is an exploding star). The gases are expanding out at a rate of over 600 miles/second, making the cloud 6 light years across. One of the most scrutinized objects in the sky, M1 is one of the strongest radio and X-ray sources. M1 is also home to one of the fastest "pulsars" known, emitting energy bursts at nearly 30 times a second, while being only a few miles in diameter. M2 is a "fine" globular cluster, it's 6th magnitude intensity making it an easy object for binoculars and small telescopes. Containing over 100,000 stars, M2 consists of primarily 14th and 15th magnitude objects. (By comparison, were the Sun at that distance it would be only 20th magnitude). M3 is one of more heavily studied globular clusters due to its position in the galaxy, putting it far from interstellar absorbtion. More than 200 variable stars have been observed out of a total of near 50,000. Being one of the brightest clusters, M3 is regarded as one of the most striking in the sky. A 6-inch scope will begin to reveal hundreds of its magnitude 11 stars, while larger instruments may show arms or branches radiating from the sides. M4 is one of the largest and nearest globular clusters. It is a fairly loose collection of stars as compared to most others, and is an easy object even in binoculars, (and has been seen with the naked eye on some occasions). There seems to be a linear collection of stars bisecting the center. In small scopes this would give a "flattened" appearance. Considered one of the finest globular clusters in the sky, M5 is frequently compared to both M3 and M13 in splendor. It's 13 billion year age makes M5 one of the oldest clusters known. Easily visible in binoculars it takes at least a 4" telescope to be able to resolve some of its 1/2 million stars. M6, along with M7 nearby are among the finest open clusters for small telescopes. M6 contains over 130 stars ranging between 6th and 11th magnitude. The central core of the cluster has been likened to a "butterfly" in shape and is about 20 light years across. An easy object even for the naked eye, M7 contains about 80 stars brighter than 10th magnitude. The cluster is currently placed at about 800 light years distant and is about 270 million years in age. Better known as the "Lagoon Nebula", M8 is one of the best diffuse nebula easily visible to the naked eye. M8 surrounds the small young star cluster NGC6530. The nebula is known for having a number small dark "globules" of material believed to be stars at the very beginning of formation or "protostars". Overall M8 is over 100 light years across, its central regions a more modest 50 light years in diameter. M9 is a small but rather bright globular cluster discovered by Messier in 1764. At 25,000 light years, M9 is one of the nearer clusters and is receding away from us at 134 miles/second. M10 is a very "compressed" cluster "easily resolvable by moderate means". M10 is receding away from us at a rate of 43 miles/second. M11 is described as an "exceptional" open cluster bordering the northern edge of the star clouds in Scutum. Resembling a globular cluster in binoculars M11 turns into a triangular swarm of stars containing hundreds of members brighter than 14th magnitude. The cluster is about 15 light years in diameter and considered to be about 500 million years old. M12 is the slightly dimmer and slightly larger sister cluster to M10. The two objects are about 2000 light years apart from each other. M12 was discovered by Messier in 1764. M13 is called the "Great Globular Star Cluster in Hercules", the most splendid such object in the Northern sky. Edmond Halley (of "Halley's Comet") discovered M13 in 1714. The cluster is visible by the naked eye as a "fuzzy star", but requires a 4 inch scope to resolve individual stars. With more than 30,000 stars having been photographed, M13 has a total luminosity of more than 300,000 suns and is about 160 light years across. M14 is a rather ill-defined globular cluster with no clear central core visible in small telescopes. M14 is one of the only two globulars which are known to have had nova (the other being M80). The cluster is approaching us at 77 miles/second. Compact M15 is known for its brilliant and slightly oblate central core. Compared to others, M15 has a rather large number of variable stars, numbering well over 100. Out on the edge a small planetary nebula was discovered in 1927. M15 is also a source of X-rays which may indicate that a supernova was once housed within its borders. M16 "Eagle Nebula" is normally considered an open cluster, it is really a nebula in disguise. When viewed through small telescopes about 100 stars or more are visible. However larger instruments will begin to show some nebulosity. Photographically M16 reveals an rich and highly complex diffuse nebula with multitudes of tiny eddies and rifts swirling among the clouds. M17, the "Swan Nebula" also called the "Horseshoe Nebula, is one of the more pronounced diffuse nebula. While there is no clear star cluster associated with M17, over 35 nearby stars are related to the complex. The main body is about 12 light years long. M18 is a relatively minor open cluster containing about 12 stars in a loose formation. M19 is a small, compact globular cluster notable due to its flattened appearance visible even in small scopes. M20, the "Trifid Nebula", is one of the more prominent objects in Sagittarius. While easily seen in small telescopes, one generally needs an 8 or 10 inch instrument before the "trifid" or "three part" structure is visible. Color photographs show the main part M20 to be a strong reddish color with a soft blue patch of nebulosity on the side. A fascinating contrast. Usually in the same field-of-view as the Trifid Nebula, M21 contains about 3 dozen stars between 8th and 12th magnitude. Ranked second only to M13 in the northern sky, globular cluster M22 was discovered in 1665. The cluster is believed to contain over 1/2 million stars and is one of the nearest. The core of M22 is about 50 light years across. M23 is one of the many fine open clusters in the Sagittarius region. It contains over 150 stars. A low power eyepiece is recommended in order to show the entire cluster. M24 is different from all of the other M objects in that it is no single entity as are nebula or galaxies. M24 is actually part of our galaxy, being a virtual "cloud" of stars. At this point the viewer is looking nearly straight in towards the center of the galaxy. M22 is visible to the naked eye and is one of the brightest regions of the Milky Way. Inside M22 is the small cluster, NGC6603. Open cluster M25 contains over 100 stars, of which 50 or so are brighter than 12th magnitude. One of the brightest stars is a Cepheid variable with fluctuates from 6.3 to 7.1 magnitude for a period of around 6.75 days. M26 is a small and condensed open cluster of about 100 total members, 25 of which are easily visible in a small telescope. M26 is about 14 light years in diameter. M27 is better known as the "Dumbbell Nebula" and is an easy object even in binoculars. This is a planetary nebula much like M57, with a dwarf blue central star which is one of the hottest known. It is believed to be under 2.5 light years across, and is expanding at such a rapid rate (17 miles/second) as to be detectable under photographic analysis. M28 is one of the smaller globular clusters in the region requiring sizable telescopes before it can be resolved. It is in a very dusty region of the galaxy, which has the effect of knocking off a couple of magnitudes from its total brightness. M29 is a fairly pedestrian little open cluster containing only a dozen of so stars of any import. It is estimated to be about 15 light years across. Globular cluster M30 is a dense object with a slightly elliptical form. It is about 100 light years across. M31, "Andromeda" is the closest and hence brightest spiral galaxy. An easy naked-eye object, M31 stretches across 4 degrees of space, requiring very low power for good seeing. The galaxy contains an estimated 300 billion stars and is nearly 200,000 light years across making it one of the largest galaxies known. The whole mass slowly rotates around the central hub, the core takes about 11 million years while the outer arms 90 million years or more. Some say that M31 looks much like the Milky-Way would from the same distance. M32 is one satellite galaxy to M31, similar to our own Magellanic clouds, but composed of older stars. M33, (Triangulum Galaxy?) the "Pinwheel Galaxy", is a member of the "local group" of galaxies and not much further than M31, the nearest spiral. M33 is a difficult object to see due to low surface brightness stretched out across a large size. Dark skies and wide-angle eyepieces are required. The galaxy is about 1/3 the diameter of M31, or 60,000 light years and is approaching us at 117 miles/second. M34 is a bright open cluster best viewed with low power eyepieces. The cluster contains about 80 stars total. M35 is a "striking" open cluster visible even with the naked eye on dark nights. It has several hundred stars and is considered a fine object even in the smallest scopes. Its diameter is estimated to be around 30 light years. M36 is a small but bright open cluster of about 60 stars. Low power is recommended for viewing. With low enough power, another cluster M28, may be visible in the same field-of-view. M36 is about 14 light years across. Considered the finest of the 3 open clusters in this region (M36 and M38 being the others), M37 is called "superb" even in small instruments. Containing over 500 stars, it ranks as one of the older clusters in the area, being over 200 million years old. M37 is about 25 light years across. Visible in the same field-of-view as M36, M38 contains over 100 stars and is about 25 light years in diameter (the same as M37). M39 is a very loose open cluster easily visible in binoculars. While called "grand" or "splashy" by some, it is considered too spread out to be a very dramatic object. Containing about 30 stars, it is only 7 light years across. M41 is a large naked eye open cluster of about 100 stars. The cluster is receding from us at around 20 miles/second and is 20 light years across. This is one of the few deep-sky objects to have been recorded by the ancients, being mentioned by Aristotle around 325 BC. M42, the "Great Nebula in Orion" is usually called one of the most beautiful objects in the sky. Visible in binoculars, it becomes impressive in large telescopes. In the middle is the quadruple star system called "The Trapezium". M42 is estimated to be about 30 light years across. As with most nebula, this one is primarily made of hydrogen, about 90% worth, about 8% is helium and the rest is carbon, oxygen and some trace elements. M43 is actually nothing more than a detached portion of M42, the "Great Nebula in Orion". This nebulosity is illuminated by its own star of around 8th magnitude. Known both as the "Praesepe" or "Beehive" cluster, M44 is one of the nearest open clusters. At a magnitude of 3.7, it is easily seen by the naked eye as a nebula, while binoculars or telescopes will resolve the stars. M44 contains over 200 stars with 80 brighter than 10th magnitude. M45 is both known as "The Pleiades" or "The Seven Sisters". This is the best known open cluster in the sky due to its size and brightness. Mentioned frequently in ancient writings, the Pleiades contains over 250 members, with a dozen visible to the naked eye. The entire cluster is surrounded by faint wispy bluish nebulosity, visually hard to see, but dramatic in photographs. In scopes, you'll need a low power eyepiece in order to capture it in its entirety. M46 is a rich open cluster, backed up by radiant star clouds of the Milky Way. Over 150 stars are known to belong to the cluster which is said to be about 30 light years across. For good viewing a 10 inch or larger instrument is recommended. M47 is a large, loose star cluster of only 45 stars and is about 17 light years across. M48 is a large fairly bright open cluster. Due to Messier recording it at a location 4 degrees away, it was considered "missing" for long time until his descriptions were paired up with the object NGC2548. It contains about 50 stars and is around 20 light years across. M49 (NGC4472) is one of the most massive elliptical galaxies known. Its nearly round form has a mass of about 5 times that of the Milky Way with a diameter of 50,000 light years. M49 is moving away from us at nearly 600 miles/second. M50 is a compressed open cluster of about 200 stars. One of the brightest stars is a red M-giant, and should stand out from its background of cooler blue-white stars. M50 is estimated to be around 10 light years across. M51 is better known as the "Whirlpool Galaxy" due to its pronounced spiral form. This was the first to be seen as a spiral in the mid-19th century. While visible in the smallest instruments, its twisted nature will not show in anything less than an 8 inch scope, while a 12 inch is recommended. With a luminosity of 10 billion suns and a diameter of 100,000 light years, M51 is roughly equivalent to M31, the great Andromeda galaxy. M 51 has a companion galaxy: NCG 5195. M52 is rich open cluster of nearly 200 stars and is about 15 light years across. M53 is a "lively" little globular cluster discovered in 1775. While visible in 3 inch scopes, a 6 inch or larger is recommended before individual stars are resolved. It is about 65,000 times as luminous as the sun and approaching us at 70 miles/second. M54 is a bright but small globular. This is a rather hard object to resolve in anything less than a 10 inch telescope. It is about 70 light years in diameter and contains over 80 known variable stars. M55 is a "loose" globular cluster, nearer than most. It is an easy target even for the smallest scopes, with stars being resolved in 6 inch instruments. The majority of M55's stars are relatively dim, below 13th magnitude, giving the impression of gaps between the brighter stars. The cluster is about 80 light-years across and is 100,000 times more luminous than the sun. M56 is a rather ordinary globular cluster which may be resolved by a 6 inch telescope. It is about 60 light years across and is heading towards us at 88 miles per second. M57. The Ring Nebula in Lyra is one of the most unusual objects in the sky, looking much like a ghostly smoke ring. This is perhaps the best known example of the "planetary" variety which exhibit a rounded form. M57 is easily visible in even the smaller telescopes, but its 15.4 magnitude central star would require 12 inch instruments or larger. The nebula is said to be expanding at a rate of about 12 miles per second, and about 20,000 years old. M58 is one of the more elegant spiral galaxies of the Virgo cluster. It has a beautiful compact form, much more symmetrical than others. It is about 50,000 light years across with a mass similar to our own Milky Way, or 160 billion suns. M59 is a very dense elliptical galaxy of the Virgo galactic cluster. With a diameter 1/4th our own, 24,000 light years, and a mass 1.6 times the Milky Way it is a very compressed object indeed. M60 (7.2x6.2) is one of the densest elliptical galaxies known. Its diameter is only one quarter of the Milky Way (25,000 light years), but it has a mass of nearly 1 trillion of our suns, or a full 5 times that of our own galaxy. M61 a "face on" spiral about half the diameter of the Milky Way and one quarter the mass. It was discovered in 1779 by an Italian astronomer who was comet hunting. Three supernovae have been observed in the galaxy, in the years 1926, 1961 and 1964. M62 is a "fine little" globular cluster, and is one of the most irregular such objects known. Being out in the galactic limb, M62 is dimmed by as much as 2 1/2 magnitudes due to intergalactic dust. The average magnitude of the brighter stars is around 16. M63 "Sunflower Galaxy" is a fine, very regular spiral galaxy with a bright nucleus. This is an example of "multiple arm" spirals due to two apparent sets of arms, one close in to the center, and the outer, looser set. The diameter is around .9 of the Milky Way (90,000 light years), and luminosity equal to 10 billion suns. M64 is called "The Black Eye" galaxy due to its dark dust lane sweeping around the nucleus. The band is said to be visible in telescopes as small as 6 inches. Low power is advised so as to boost the contrast between the disk and the dark streak. M64 is believed to be about 50,000 light years in diameter, or half of our own Milky Way. It is moving away from us at 225 miles/second. M65 (NGC3623) is a fairly bright oblique spiral, visible in binoculars with its neighbor, M66. M65 has an estimated diameter of 60,000 light years, with M66 being 60,000. The two objects are themselves separated by only 180,000 light years in effect making them "twin" galaxies. A third galaxy, NGC-3628, is nearby. Together, M65, M66, and NGC 3628 are known as The Leo Triplet. M66 is a fairly bright oblique spiral, visible in binoculars with its neighbor, M65. M65 has an estimated diameter of 60,000 light years, with M66 being 60,000. The two objects are themselves separated by only 180,000 light years in effect making them "twin" galaxies. A third galaxy, NGC-3628, is nearby. Together, M65, M66, and NGC 3628 are known as The Leo Triplet. M67 is a fine open cluster of over 500 stars and is 12 light years in diameter. It is known as one of the oldest clusters visible, being around 10 billions years old. M68 is a rather smallish globular cluster of about 100,000 stars. A 6 inch scope will begin to resolve individual stars, with larger instruments needed to reveal its richness. M69 has been described as looking like "the nucleus of a little comet", revealing its relative merits. Even in moderate sized scopes little detail can be seen. Its diameter is estimated to be at around 70 light years. M70, like its twin globular cluster, M69 has been described as looking like a comet's nucleus. It is slightly dimmer than M69 as well as being smaller, although it is said to be "clumpy" along the edges. M70 is around 80 light years in diameter. M71 is an unusual object in that is it not easily classified. Some call it a dense open cluster, while others, a globular. The makeup of its stars are different from either open or globular clusters. M71 is about 30 light years in diameter, half that of a typical globular. Its compact form is hard to resolve in smaller scopes. M72 is one of the duller globular clusters in the heavens. With the brightest stars being no greater than 15th magnitude, even the largest amateur instruments will have problems resolving it. The cluster is about 85 light years across. This is not a real cluster, but is merely a formation of four stars. Not one of Charles Messier's more noteworthy objects. M74 Considered the most difficult of all Messier objects to find, M74 suffers from a very low surface brightness. (Surprising since it has a mass of 58 billion suns). You should use a large scope with low-power eyepiece. But even under the best conditions the spiral structure will be invisible. M75 is a dim, but "rich" globular cluster, about 125 light years across. Due to both its distance and compactness, one will need a sizable instrument to resolve any stars. The brightest ones average around 17th magnitude. M76, the "Cork Nebula" "Little Dumbbell Nebula?" is called one of the dimmest of the Messier objects. While considered a planetary, it doesn't exhibit the usual round shape. Its central star is one of the hottest known, being a blistering 110,000 degrees F (60,000 degrees K), as compared to our own sun which is a relatively balmy 6000 degrees F.
M77 is a smallish, but bright spiral galaxy containing 3 sets of spiral arms. This is a speedy character, moving away from us at a rate of 620 miles/second. M77 is also a source of radio emissions known as "3C71". It is about 100,000 light years in diameter and has the luminosity of around 35 billion suns. Seyfert Galaxy. Diffuse nebula M78 is an easy object for small telescopes, but shows little detail. One of the many visible nebula in Orion, M78 is only 2 or 3 light years across. M79 is another one of Messier's small and unimpressive little globular clusters. It requires at least an 8 inch telescope before the outer 14th magnitude stars are resolvable. Its luminosity is equal to about 90,000 of our suns, and its diameter is around 110 light years. M80 is a very compact, but bright globular cluster about 50 light years in diameter. Due to its density, some scientists have estimated that over its history, there have been nearly 3000 stellar collisions within its boundries. M81 is a splendid spiral galaxy. Only spaced 38 minutes away from M82, this pair makes one of the most dramatic such duos in the sky. Being rather bright, both objects are easily visible in small telescopes. M81 is regarded as one of the most beautiful spirals in the sky. It is only about one-third the size of the Milky Way, 36,000 light years across, and has a luminosity of 80 billion of our suns. M82 is the sister galaxy to M81, just 38 minutes away. 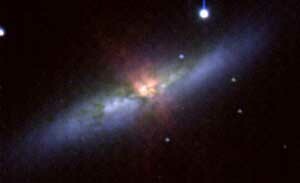 This is a fine example of an irregular galaxy, looking more like a galactic cigar than anything else. Generally easy in small telescopes, it takes a larger instrument before the dark dust lanes can be seen. M82 is also a strong radio object. This is one of the smaller galaxies, being only 16,000 light years across, one-eigth that of the Milky Way. M83 is one of the most well defined spiral galaxies in the Southern hemisphere. It is about 30,000 light years across. In the past 50 years, 4 supernovae have been reported in M83. This is surprising, since supernova generally occur only once every several hundred years per galaxy. M84 This is a bright elliptical galaxy of about 25,000 light years in diameter. It is estimated that M84 has the luminosity of one-half trillion suns. Paired with M86 only 17' away, this makes a fascinating object. M85 is a fairly bright irregular galaxy of the Virgo cluster. It is believed to be about 40,000 light years across, with a mass of 100 billion suns. It is traveling away from us at 450 miles/second. M86 is the twin galaxy to M84. Both are of the elliptical variety, and look similar to each other. M86 is unusual in that while appearing to be a member of the Virgo cluster, it is moving in the opposite direction, approaching us at the rate of about 280 miles/second. M87 is one of the most massive galaxies in the Virgo cluster and of all known galaxies. It is calculated to be about 800 billion more massive than the sun, and is moving away from us at 755 miles/second. In detailed pictures literally hundreds of globular clusters may be seen swarming around the main body. It is estimated that there are over 1000 clusters, and possibly as many as 4000, the Milky Way only 110 known. M88 (NGC4501) is a spiral galaxy of about 60,000 light years across. It is one of the faster moving objects, heading away from us at nearly 1300 miles/second. Some regard it as a fairly easy galaxy for small telescopes. Messier discovered M88 in 1781, and described it merely as a "nebula without a star". M89 is a rather dull elliptical galaxy of about 250 billion times the mass of our sun. It is moving away from us at a leisurely rate of 130 miles/second. Spiral galaxy M90 was discovered by Messier in 1781 and is about 80,000 light years across. It is moving away from us at a rate of 555 miles/second. M92 X-Ray Source. M92, a globular cluster (NGC 6341), is a bit smaller and dimmer than M13, but still an interesting object to view with a small telescope. It is about 25,000 light years away and is located north of the trapezoid of stars called the Keystone. The Keystone lies about a third of the way along a line running from the star Vega to Arcturus, (the recognizable feature in the constellation Hercules.) One of the earliest constellations to be named, Hercules (The Strongman) is not especially bright, and it takes some imagination to picture the man, as he is upside- down, kneeling, with one foot on the head of Draco. M93 is a nice open cluster, an easy object for small scopes. It contains over 60 stars and is about 18 or 20 light years across. M94 is a bright, nearly face-on spiral. Called by some an easy object for small scopes. It is about 33,000 light years across. M94 is interesting in that it is believed to be the victim of a violent explosion several million years ago. M95 is frequently paired with M96, both visible in the same field-of-view when using a low power eyepiece. Both are members of the "Leo Galaxy Group" and are moving away from us at 420 miles/second. M96 is frequently paired with M95, both visible in the same field-of-view when using a low power eyepiece. Both are members of the "Leo Galaxy Group" and are moving away from us at 420 miles/second. M97, the "Owl Nebula", is considered to be one of the largest planetary nebula. Its surface brightness is fairly low, making it a difficult object for small telescopes. It is estimated to be about 3 light years in diameter. Its central star sits at 14th magnitude, and is one of the hottest objects known, blazing away at over 150,000 degrees F (85,000 degrees K). Compare that to our sun at a brisk 10,000 degrees F at the surface. M98 is a fairly large spiral galaxy discovered in 1781. It is nearly edge on to us, and is an estimated 80 light years across. The galaxy is moving in the opposite direction from the rest of the Virgo cluster, coming towards us at a rate of around 125 miles/second. It has a mass of over 100 billion suns. M99 is a nearly face on spiral about half the size of the Milky Way, being 50,000 light years across. This is one of the fastest galaxies in the Virgo cluster, speeding away from us at nearly 1500 miles/second. M100 is a nearly face-on spiral, similar to M99. It is a fairly poor object in small scopes, appearing to be nothing more than a dim globular cluster. It is a little over 100,000 light years across, about the same size as M31. Its arms have been estimated to be roughly 3000 light years thick. M100 is traveling away from us at about 960 miles/second. The beautiful face-on galaxy, M101 "Pinwheel" was discovered in 1781. It is estimated to have a mass of equivalent to about 16 billion of our suns or only 10% of the Milky Way. This makes it one of the lowest density galaxies known. M101 is also believed to be about 90,000 light years in diameter. A total of 3 supernovae have been observed in M101, in the years 1903, 1951 and 1970. Open cluster M103 was the final entry into Messier's original listing. Over 40 stars have been counted in the cluster which is 15 light years across. M104 is better known as the "Sombrero" or "Dark Lane" galaxy. It is an edge-on spiral, sometimes considered almost as a hybrid type between elliptical and spiral. It is estimated to be a little over 80,000 light years across. As with most galaxies, M104 is slowly rotating around its core. Its rate is believed to be around 25 million years for a single rotation, slightly longer than the Milky Way's rate. M106 is a fine spiral galaxy about equal in mass to our own Milky Way, 160 billion solar masses. It has two main arms extending out of an otherwise fairly uniform disk. M107 is a small fairly sparse globular cluster. This was discovered by Pierre Mechain, a fellow comet hunter who would bring his information to Messier to be confirmed. While Messier's notes mentioned the cluster, it was never entered into his catalog. Working from his original notes, astronomer Owen Gingerich extended the catalog up through M109 in 1954. M108 is another one of the extended objects added to Messier's catalog in 1954 (based on his original notes). It is a nearly edge-on spiral galaxy about one-tenth the mass of the Milky Way.